Ever since we brought Clara home from the hospital, her most frequently heard nickname has been “Clara-bug.” If she’s sleeping, she’s a sleeping-bug, if she’s bouncing in her jumper, she’s a bouncing-bug, if she’s snuggling, she’s a snuggle-bug, if she’s wiggling, she’s a wiggle-bug. Well, you get the idea. All day long, Clara-bug is getting called some sort of a bug. So, it seemed fitting that for her first Halloween, she’d be a ladybug. We’ve had a busy day! This morning we went to our last mom’s group/playdate for the winter. We were missing one of our friends who had a cold, but we got some cute photos of these three babies all together. I’ll miss seeing them the next couple of months. By the time March rolls around, they’ll all be toddling around on their feet! Cute card we made to take on our trick or treat visits tonight. That ghost is her footprint. And then we took a few more photos. Happy Gotcha Day to Rufus! We're thankful for that Halloween four years ago when you found us! A quick cell phone pic with Uncle Frank! After such a busy day, Clara was ready to slip into her ladybug pajamas and read a story before bedtime. She’s sleeping soundly now. And her Daddy is eating all her candy. She's the cutest bug I've ever seen!! Glad you got to have a great Halloween, (and glad Robert got some candy)!! Thanks so much for coming to see us on Clara's first Halloween! It was a joy to share her with friends. What a sweet little bug she is! Love these pictures and the story with them. Wish we could have shared Halloween with you guys. Much love to you all! What a cute "Love Bug"! So thrilled to watch her personality beginning to show in pixs. Praying this first winter is safe and healthy. Maybe the cabin fever will not get too bad. Just riding in the car may become a wonderful activity. 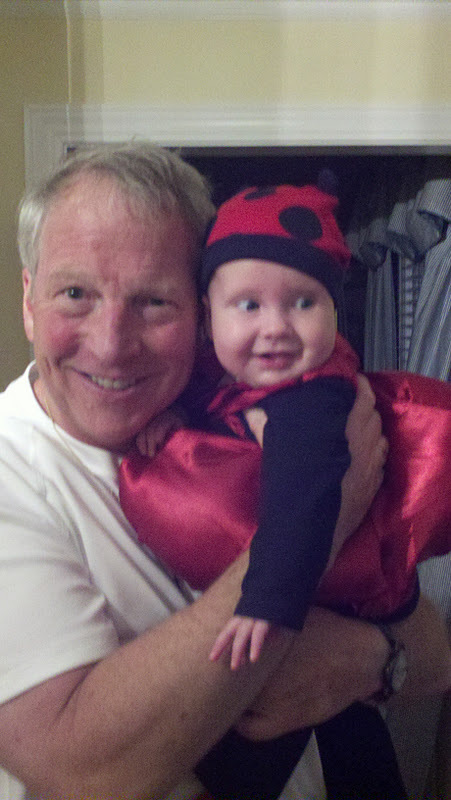 I have always heard that ladybugs are GOOD for us .... now I KNOW they are!!!!!!! What a wonderful 1st Halloween. Clara Mae is our TREAT for sure. I love the picture of you reading to Clara and her laughing. I think Mama-Bug should become a writer. Your post about the 1 year anniversary of Clara's diagnosis while you were pregnant really touched me. You have a gift. I'm serious !! I'm going to second that you should become a writer! You are very gifted indeed! Future book title...... "the Brave Little Ladybug"??? 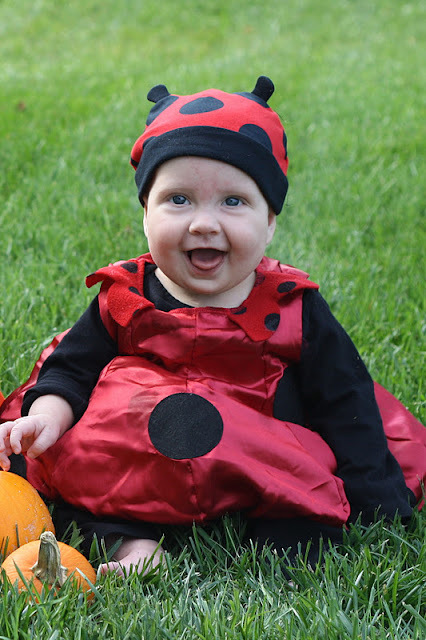 Oh my goodness - how cute is that with her sitting in her mommy's lap, in her ladybug costume, with a stuffed ladybug, reading a ladybug book!!! It just doesn't get much better than that! And the adorable card with her footprint on it. These posts just brighten up my day. You are such a wonderful family. I agree - you should become a writer. SHe is so beautiful and brimming with smiles! Praise the Lord for this blessing of a happy Clara.